Carbon capture and storage (CCS) is the only technology that can help decarbonise the energy intensive industry to help meet the UK’s carbon targets. That’s according to a new report form think tank Green Alliance, which claims the UK’s approach to developing CCS only focuses on cutting the costs of electricity production. It believes the nation’s current policy “will not deliver cost effective CCS quickly nor will it develop the technology in a way that is relevant to industry”. Funds to develop CCS are directed through the electricity market as part of a framework that encourages competition between renewables and nuclear to find the lowest cost technology for generating electricity. The report argues that as a new technology, CCS is still very costly which means it is unlikely to compete well with cheaper, more established low carbon options. 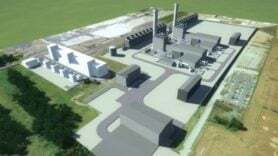 The government has so far initiated two CCS demonstration projects – the White Rose coal plant in Yorkshire and the Peterhead gas plant in Aberdeenshire. Green Alliance suggests the UK could increase the value of its existing CCS investment by using power stations to create so-called industrial “clusters”. The White Rose project, as currently proposed, is estimated to cost around £250 per tonne of CO2, which includes the full cost of capture, an oversized pipe designed to transport CO2 and a storage facility and associated infrastructure. The report estimates the total investment cost of White Rose would be around £5 billion over the 15-year lifetime of the Contracts for Difference (CfD) but turning it into a cluster would have a cost of up to £20 billion or £1.3 billion a year. “Although it would need four times more investment than a single plant, a cluster would still be much more cost effective. It could store nearly nine times more CO2 and cost close to two thirds less per tonne of CO2, compared to a single plant”, it adds. It would not be a uniquely large project for the energy sector as 2.2GW of offshore wind would cost £1.2 billion a year and the Hinkley nuclear project is expected to cost around £2.3 billion a year, according to the Green Alliance. The report has set out three recommendations for the government to ensure an “economically viable” future for CCS – identifying and supporting CCS clusters, adapting CCS policy for industry and creating a new funding mechanism to support CCS clusters. Dustin Benton, Head of energy at Green Alliance said: “CCS is one low carbon option amongst many for the power sector. But to decarbonise industry, CCS is the only choice. A report from the Energy Technologies Institute (ETI) revealed a 10GW scale CCS sector by 2030 is “feasible and affordable” in the UK .